Dorfburg is lieu-dit that is located equidistant from Ingersheim, Katzenthal, Turkheim and Niedermorschwihr. The bedrock the Jurassic and contains round, quite soft particles built up of concentric layers of limestone. It is called oolitic - egg-shaped - limestone. The rock weathers to a calcareous but not heavy clay. It is perfect terroir for Pinot Gris and Gewurztraminer that become fresh, firm and full. 2007 Pinot Gris Dorfburg from Meyer-Fonné in Katzenthal is bright yellow. The fragrance is developed and absolutely clean with notes of dark chocolate, figs, oranges and toasted almonds. The palate is dense yet light, but a great acidity that supports the discrete residual sweetness and creates lovely balance and harmony. 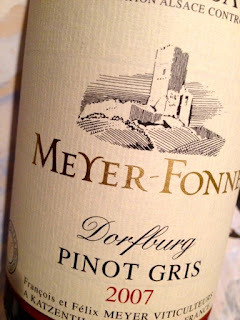 You never get enough of the wines from Meyer-Fonné! Price: € 12.50.